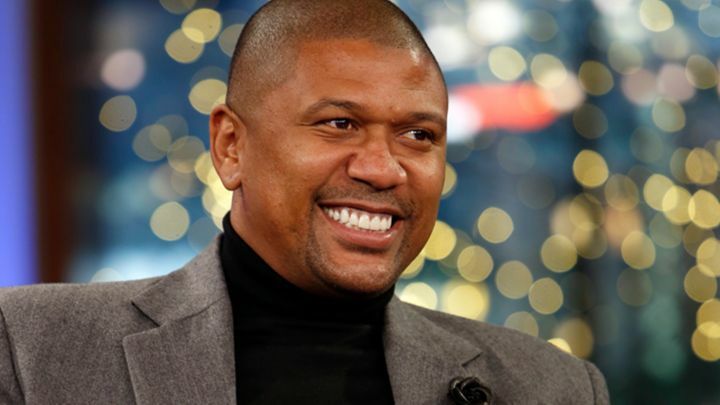 As if his rise to fame as a member of Michigan’s Fab Five – or his sartorial splendor at the 1994 NBA Draft – didn’t make it apparent, Jalen Rose is at his best when the cameras are on. During his 13-year NBA career, Rose showed remarkable versatility, playing all three backcourt positions and proving to be not just a strong ball handler and willing passer, but a tremendous scorer. He was, in short, a complete offensive player – and sneaky fun to watch. So when he retired, it was only natural that this former communications major with a surplus of charm (and catchphrases) would move into commentary and broadcasting, and Rose has become a standout at Bill Simmons’ Grantland and on ABC’s NBA coverage. On Christmas Day, he’ll head to Miami with the NBA Countdown crew, during a doubleheader that features a Western Conference showdown between the Thunder and Spurs, and LeBron James’ return to Miami, when the Cavs take on the Heat. Before he spends Christmas on the road, Rolling Stone caught up with Rose to discuss his approach to analysis, the unique struggles of being left-handed in the NBA and the perils of getting ejected on Christmas Day. Absolutely. I constantly pay attention to different channels, different avenues, different platforms. Like for example, it’s tough to engage different crowds and still be an effective media personality. So you may see me on my podcast with [David] Jacoby, where I’m holding a bat and wearing sunglasses, and then you may see me on Grantland with the man-cave version of a living room with my good buddy Bill Simmons. And then you may see me on Friday and Sunday with Sage [Steele] and Doug Collins, talking about the game we love, and then Wednesdays with Avery [Johnson] and Doris [Burke]. In a way, I’m kind of in a rare position: I’m one of the people who gets to work in his major – that’s what my major was, mass communication. Of all those gigs, which is the most fun to do? I think the awesome thing is that I get to express myself in a lot of different forms and formats. Like ABC, for example, that’s a basketball show, so I won’t get the time to elaborate on other social topics, whether it’s what’s happening in Ferguson or what’s going on in New York City, so I get the chance to do that on my podcast. The Grantland television audience with Bill is more the cool kids that are really smart about sports: smart alecks. [It’s] kind of like our Nick Nolte and Eddie Murphy, 48 Hrs., buddy-cop thing. And being with Sage and Doug, that’s more professional. It’s the NBA’s lead-in to a Christmas Day game, or a playoff game or the NBA Finals. That’s intimate NBA news. Speaking of that, are you upset that you have to work on Christmas Day? When you work in entertainment, when there’s a holiday or there’s a reason for people who have 9-to-5 jobs not to work, those are the times you want to be working in entertainment. You want your movie to debut on Christmas, you want to be working on Christmas. You want to be working the Finals. The stage doesn’t get any bigger. Let’s talk about basketball. When you’re watching a game, what are you actually watching? It’s like a Rubik’s Cube: I’m looking at everything. It all depends who’s playing. If you watch the Memphis Grizzlies play, it’s a ground-and-pound. If they’re successful, it means they’re dominating the paint. So I’ll look to see if Zach Randolph is getting two-foot paint touches or if Marc Gasol is able to catch it on his sweet spot at the elbow. I pay attention to the offensive and defensive rebounding numbers. These coincide with the teams that you’re watching. Like Cleveland, you’re going to pay attention to their 3-point shooting, because that’s going to be a huge thing for them. You have [Kevin] Love, you have Kyrie [Irving], you got LeBron penetrating – he’ll catch it and pitch it to the 3-point line. Are they getting those shots? Are they off the dribble? Off the pick-and-roll? It all depends on the team you’re watching and different players. I’m one of the guys that really defends Russell Westbrook and his style of play because he plays on a team that needs him to score 25 points, even though he plays with an MVP in Kevin Durant who’s also a four-time scoring champion. They need both of those guys to score. So when they’re out there, I’m paying attention to their fast-break points. Are they getting easy shots? There’s a lot of different things you watch for when you flip on a ballgame. What team have you enjoyed watching the most so far this season? I appreciate Memphis. I appreciate the Golden State Warriors. Because the league has become homogenous, where most teams on a 3-on-2 or 2-on-1 break are running around for a 3-point shot, Memphis still plays a traditional four [power forward], a traditional five [center]. The Golden State Warriors are just the opposite. They’re the most fun League Pass team. They’re fun to flip on during a Wednesday, because they’re going to run up-and-down the floor, Steph Curry’s going between the legs, behind the back, shooting game-winning threes. Those two teams in particular stand out. What about the other end: who’s been hard to watch? Well, I’ll say who’s surprising: I thought Charlotte would be better. They made the playoffs last year, Al Jefferson is a 20-10 player, a technician down on the block who can turn over both shoulders. Re-signing Kemba Walker – he’ll break your ankles. He’s clutch going back through his college days. Zeller’s shown flashes. But Lance Stephenson, for whatever reason, hasn’t fit into being an efficient basketball player, shooting in the 30s from the field and even lower than that from 3-point range. So I ask this of every left-handed player I talk to: Did you ever find being left-handed to be a particular advantage for you on the court? It is not an advantage. And the reason I say that is because you have to be so uniquely gifted – and I say that with all humility – to be a left-handed player in the professional ranks. Less than 10 percent of players in the NBA are left-handed. There are teams that do not have a left-handed player. So the whole geometry of the floor is different. Let me give you an example. One of the things that really worked when I played in Indiana with Reggie Miller was that Reggie, being a right-handed player, liked to operate on the left wing, and me being a left-handed player, I liked to operate on the right wing. So it balanced the floor. That’s why we were both able to have 40 points in the same playoff game against Philadelphia one time. So you have to be uniquely talented. That’s why a lot of lefties get called “crafty” a lot – they use the “Eurostep,” that lefty step. You watch Manu [Ginobili] play, you watch [James] Harden play, Lamar Odom when he was playing; that term “crafty” comes up a lot. They’re almost the thinking man’s basketball player. You also played a lot of different positions. What did you learn playing point guard that helped you when you played small forward? You know, being 6-foot-8 since high school, I played initially with Voshon Lenard, who went on to have a long NBA career and star at the University of Minnesota, and Howard Eisley, who did the same thing with Utah and played in a couple Finals. Howard was a year ahead of us, so he handled the ball and I was a point forward. Then when he left, I became more of a ball-handler my senior year. So I was a point forward in high school and then when I signed to play at Michigan, we got Jimmy King: he’s high-flying, he’s from Texas, he’s a shooting guard. Ray Jackson’s going to do his thing at the three. And obviously we got Chris [Webber] and Juwan [Howard], so where’s Jalen going to play? So I became the point guard at Michigan. I got drafted by Denver to play point, then when I got traded to Indiana I started to play more off the ball like a wing. In Chicago, I played shooting guard. So what I learned is that you have to learn where everybody needs to be at all times. But really, positions were just created so a novice can follow the game. Your skillset is your position. If you’re a willing passer, you can be the primary ball handler. That’s really what it boils down to. LeBron’s the primary ball handler, Scottie Pippen was the primary ball handler. You are your skillset. Period. I think people will grow into that idea over the next 7-10 years. Did you ever play on Christmas Day? I did. One time, I was playing for Indiana and we were going against Tracy McGrady. At the time, Orlando had just signed him and Grant Hill. Unfortunately, Grant Hill was dealing with some injuries. But it was a big game to go against [McGrady] and I think I had like 30-plus points. Another time I was playing against the Knicks, got tangled up with Kurt Thomas. He elbowed me and pushed me and we both got ejected. I was upset about that because Christmas Day, it’s a horrible day to get ejected.